The novelty may have worn off for some, but the NHL continues to stage outdoor games at huge football and baseball stadiums as a way to promote its brand. The annual New Year’s Day outing known as the NHL Winter Classic just wrapped up at Notre Dame Stadium in South Bend, Indiana. The Boston Bruins edged the Chicago Blackhawks 4-2 in an Original-Six tilt in front of 76,126 fans, which reportedly represented a sellout crowd. 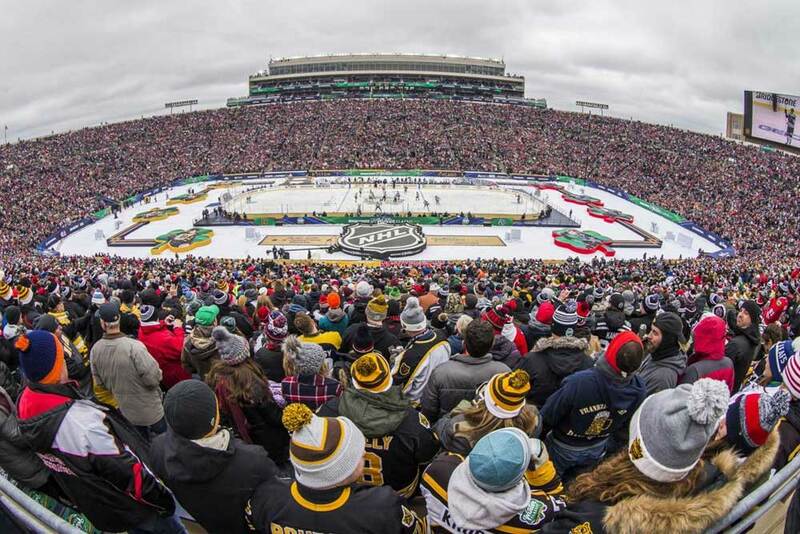 In fact, it was the second-biggest crowd for an NHL game after the 2014 Winter Classic between the Detroit Red Wings and Toronto Maple Leafs which drew a world record of 105,491 people. The Leafs won that thriller 3-2 in a shootout. League commissioner Gary Bettman announced next season’s plans during the contest between Chicago and Boston so let’s go over them now while they’re still hot off the stove. There will be three outdoor contests in the 2019/20 campaign and things face off early in the schedule with the Calgary Flames taking on the Winnipeg Jets on October 26th. This event is known as the Tim Hortons’ NHL Heritage Classic. In a bit of an oddity, there’s not really a home team in this all-Canadian showdown since the game will take place at the Mosaic Stadium in the city of Regina, Saskatchewan. The facility is the home ground of the Saskatchewan Roughriders of the Canadian Football League (CFL) and can hold up to 40,000 people. The Heritage Classic hasn’t been staged since 2016 and this will be the fifth one overall. The Edmonton Oilers blanked the Winnipeg Jets 3-0 in Winnipeg in the last contest and Calgary played in the second Heritage game when they downed the Montreal Canadiens 4-0 at home in 2011. The second outdoor game will almost certainly be held in warmer weather as the Dallas Stars are scheduled to host next season’s Winter Classic on New Year’s Day 2020 at the Cotton Bowl Stadium. This ground has a capacity of 92,100 and opened for business way back in 1930. The third and final outdoor event takes place in colder climes again as the Colorado Avalanche have been penned in to host an NHL Stadium Series contest on February 15th 2020 at the United States Air Force Academy’s Falcon Stadium, which sits in Colorado Springs. This field is used for college football and can fit approximately 46,700 spectators. The history of regular outdoor NHL games can be traced back to the Heritage Classic in November of 2003 when Montreal edged Edmonton 4-3 at Edmonton’s Commonwealth Stadium with 57,161 fans on hand. This wasn’t the league’s first attempt at outdoor hockey though as exhibitions were held in 1954, 1956 and 1991. The September, 1991 preseason affair was held in Las Vegas, Nevada when the New York Rangers humbled the Los Angeles Kings in front of 13,007 fans in the parking lot at Caesars Palace. The ice remained in good condition despite the heat, but the playing area was invaded by thousands of grasshoppers and other insects during the contest. Bettman also announced that the 2019/20 NHL All-Star Weekend will take place from January 24th to 26th at the Enterprise Center in St. Louis, Missouri, the home rink of the St. Louis Blues. This will be the third time the city has hosted the league’s All-Star Game as it was held there in 1970 and 1988. The annual All-Star Weekend also features an on-ice skills competition as well as numerous other activities. For the Dallas Stars, the game at the Cotton Bowl will be their first outdoors while the Colorado Avalanche will be playing in their second. They came out on the wrong end of a 5-3 decision to Detroit Red Wings in 2016 when they hosted them at home at Coors Field with 50,095 fans in the stands. Next season’s game in Colorado Springs will be the second held at a U.S. service academy venue. There were 29,516 fans in attendance when the Washington Capitals beat the Toronto Maple Leafs 5-2 in March of 2018 at the U.S. Naval Academy situated in Annapolis, Maryland. As of yet, there hasn’t been an opponent named for Dallas and Colorado in next year’s Winter Classic and Stadium Series contests, but Bettman is expected to name them in the next month or so. The current season is only half way through and there are still a couple of special events to be held. The All-Star Weekend will take place from from January 25th to 26th in San Jose, California and the Pittsburgh Penguins will visit the Philadelphia Flyers in an Outdoor Series clash on February 23rd. This match will be held at Lincoln Financial Field which is the home of the NFL’s Philadelphia Eagles and has a capacity of 69,176. The Penguins have played in four previous outdoor games while the Flyers have appeared in three. The teams met in front of 67,318 fans at Heinz Field in Pittsburgh in February of 2017 with Pittsburgh doubling the visitors 4-2. While the NHL has consistently drawn huge crowds for its outdoor games, the sport in general has been quite successful when it ventures outside. Games in Europe have attracted crowds of over 50,000 in Germany while the American Hockey League has seen 45,000 in the stands. In addition, the second-biggest attendance for an outdoor game was set in 2010 for an American college hockey contest between the Michigan Wolverines and Michigan State Spartans when 104,173 fans showed up. Last Year’s World Junior Championships pulled in a crowd of 44,592 when the USA beat Canada 4-3 in a shootout.